Again, big props to Nathan for ID’ing Sloan Thomas, who just walked up during the event to say hello to Vince Young and Kasey Studdard. The ‘box’ also came in handy again. I keep it packed full of Longhorns just in case one shows up at an event unexpectedly, and luckily I was packing a card of Sloan that I had gotten a few months ago. I’m sure he was surprised that so many fans recognized him. Noticing my Oilers hat, he struck up a conversation about Houston, and how I had to have been a tough fan to be with them through those good years, and bad post season games (- in particular the Buffalo collapse), as he was apparently a big fan too. He asked me if I was a Texans fan or a Titans fan, and I explained how I tuned out pro football for a few years after the Oilers moved to Tennessee- so I obviously wasn’t a tacks fan. 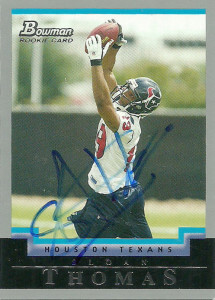 After going out to my car and retrieving the Texans card of him, his eyes lit up and he exclaimed, “Look at that!”, before happily signing my card. Otherwise Sloan looked quite dapper, and it appears life has been treating him well.